Welcome to the first edition of Energy Crunch, the new newsletter from nef devoted to the crucial nexus between energy, the economy and the environment. Once a fortnight we plan to give you a concise summary of the most important developments, highlight a handful of stories you may have missed but really ought to make time for, and offer our take on what’s really going on behind the headlines. We’ll also point you to the ‘chart of the week’ or another piece of research that illuminates the debate – our first is a cracker. Or perhaps that should be fracker. Energy Crunch? What energy crunch? To listen to news recently you could be forgiven for thinking all the energy supply worries of the last few years have been miraculously solved. Peak oil is dead, the UK is floating on a bed of shale gas and everything’s rosy. There has certainly been a shift in the debate, but when you dig beneath the surface, it’s not at all clear how much the energy supply picture has actually improved. Let alone the greenhouse gas emissions. George Osborne fired the starting gun on what he hopes will be a shale gas boom by slashing production tax rates to just 30% – half the normal level. The announcement came shortly after the release of a British Geological Society (BGS) report which doubled the estimated gas resource of the Bowland Shale formation under Lancashire and Yorkshire, leading to exuberant claims that this alone could cover Britain’s gas needs for 50 years. The government, gas drillers and some of the media would have you believe this locally produced gas will keep the lights on, kickstart the economy and slash gas prices. So what’s not to like? First, there is a major question over how much gas is ever likely to be produced. Most of the optimism around shale gas is based on the US experience, but conditions here are very different. Art Berman, an American industry consultant, has analysed the BGS assessment and reckons Bowland has recoverable reserves – always much smaller than the total gas that exists in the rocks – of 42 trillion cubic feet, or about 15 years’ supply at current levels of consumption. To produce this would mean drilling around 30,000 wells, and that level of industrialisation seems likely to provoke a major backlash. Perhaps that wind turbine doesn’t look so bad after all? Second, even if there were substantial shale gas production, it is unlikely to put much of a dent in UK gas prices, whatever ministers suggest. The Telegraph reported that an analysis by consultants for the Department of Energy and Climate Change had found that shale production could cut UK gas prices by a quarter, without mentioning this was only one of a series of scenarios. However, the overwhelming consensus among gas experts is that the impact would be minimal, since UK prices would still need to be high enough to attract imports from Europe, and would be buoyed by European demand for UK supplies. Those who argue this include: Oxford Institute of Energy Studies; VTB Capital; BP; the Energy Contract Company; Poyry and others. Third is the issue of potential water contamination – always hotly contested by the frackers – which was raised again last week by Water UK, the industry trade body. Fourth is that burning all this non-conventional gas is in almost certainly incompatible with our legally binding emissions reduction targets. But perhaps it’s no surprise this awkward fact has been conveniently ignored: it has been clear for some time that George Osborne has largely relieved Ed Davey of responsibility for UK energy policy. Of course, fracking can be used to produce oil as well as gas, and this has led to surge in US oil output in recent years – after decades of decline – prompting a rash of stories that ‘peak oil is dead’. John Kemp of Reuters was one of a slew of commentators to claim that new technology has trumped the doom mongers once again. These writers seem not to have noticed that the oil price is more than 10 times the level of the late 1990s, and last year recorded its highest ever annual average at just under $112. Nor that that the decline rates of the new shale oil wells are much steeper than conventional wells – losing as much as 40% of their production capacity every year – which means the industry really must ‘drill baby drill’ simply to stand still (check out our chart of the week). Nor that rising consumption among major producers is cannibalising exports – Saudi Arabia will become a net oil importer in the 2030s on current trends. Nor that – with much of the world economy in the doldrums – current prices appear to be an effective cap on economic growth. Perhaps the anti peak oilers are right to suggest we can produce some more oil at higher prices, but they seem to miss the broader point: we can’t afford it. Far from peak oil being disproved, it’s right here; economic peak oil. For a truly disruptive plan this week take a look at the Centre for Alternative Technology’s 3rdZero Carbon Britain report. Even the International Energy Agency is forecasting that globally renewable electricity will exceed output from natural gas and double generation from nuclear by 2016. The prospect of 30,000 gas wells might give the anti wind brigade pause for thought. Perhaps there is still a chance of a real energy policy rather than the Jekyll and Hyde struggle currently being played out in Whitehall. The World Bank cuts off funding for coal. How big an impact will that have? You received the newsletter because you previously subscribed to the ODAC newsletter which was taken over by nef in March 2012 . To see the archive of ODAC newsletters follow this link. Have you ever sat back and imagined what a perfect (Well, a very much improved one at least) local economy would look like. I was fortunate enough to have that invitation to reflect when I was involved in the dreaming up of the ideas and projects for our successful lottery bid. Two of the strands that we entered into the bid were for a community owned energy services company and for the Harborough pound, as local complimentary currency that helps lock wealth into the local economy. The Energy services company would provide investment opportunities and the ability to benefit from the proceeds of renewable energy projects as an Energy Generator. Now the disconnect to my mind is how could we link the currency to the generation…. we need to also sell that energy into our local populace who could then pay using our local currency thus creating a virtuous loop as an Energy Supplier. I briefly looked into this over a year ago now and managed to ascertain that the departments I contacted at DECC and OFGEM did not know what the process was nor what was involved in becoming an energy supplier. A little worrying that. This time I shall start will them again as one or the other should be involved, if I fail again I shall try Greg Barker and Ed Davies and push on from there. Wish me luck and if you have any thoughts then please do not hesitate to get in contact. Tomorrow will see our group of volunteers meeting for the second time (We meet every two weeks for mow) to discuss anymore user storys that have been thought of and to try and document a few user journeys. Feel free to join us, 7.30pm at the Sustainable Harborough offices on Abby Street (on the corner above the sigh makers) if you have any interest in promoting local food. Last night was our first meeting of our Local food hub work group, a team of volunteers aided by our project manager Gavin Fletcher, wrote out a series of user stories to describe processes and features of our proposed local food hub. The stories are all written from the perspective of different users of the system, a process often used in Agile development environments. We aim to meet every two weeks and our next step is to get some local food producers to attend our meetings and give their perspective of how the system should work. Local food hubs are not new with StroudCo and DE4 being notable examples along with a fast growing movement across the world. These projects have all written their own software solutions and admit that there are many limitations and bugs. It is our objective to create a platform that will work well for all and bring our local producers in contact with their local customers. Great progress was made a this meeting by our core volunteers Gillian Baverstock, Dr Judith Egan, Sue Hambleton and of course myself Darren Woodiwiss and we look foward to meeting with a growing food hub group in the future. We are delighted to announce that we will have a stall once again at the 2013 Shambala festival which is held at a secret location nearby in Northamptonshire. This festival fits beautifully with the Transition philosophy as it is amongst the Greenest festivals in the world and top two in Europe. We will be there promoting the Sustainable Harborough project which launches in early August and our own projects outside of its scope. My name is Nick Sherwood, - I'm a long-term resident of Herefordshire which is on the Welsh border in the UK. I've lived here for over 30 years and for the last 20 or so I've been working in the environmental field, initially in sustainable waste management, then in carbon management. 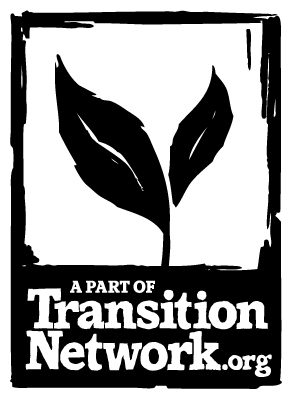 I've been involved with the Transition movement since 2008, helping to set up firstly Transition Hereford which was the 83rd official Transition initiative and more recently the Herefordshire in Transition Alliance which brings together a number of environmental groups around Herefordshire. You've just completed the second of the economic blueprints as has happened in Totnes and is about to happen in Brixton. Your one wasn't called a blueprint, it was called an Evaluation. Could you give us a bit of background as to how the process that you ran differed from the process that took place in Totnes and also why you chose to call it an Evaluation rather than a Blueprint? I think it's no secret that while Totnes is perhaps not unique it has a very particular profile in terms of development, so it's hardly a surprise that things would look a bit different in Herefordshire from in Totnes. In fact, the two economies are of different kinds of scale. The Herefordshire economy is roughly twice the size of the South Hams District economy. And it's a unitary authority which means we've only a county council, no district councils, whereas South Devon is a tertiary authority. So there are quite a few differences, which means that our starting points would be different, and the way a project evolves has a lot to do with where you start. I'm not aware that anybody other than in Totnes has used the word 'blueprint'. Certainly when Fiona Ward and I started on this journey in 2011 I was aware that she was using the term blueprint. I made a conscious decision then - one I still stand by - to not use that term. This was because we did not already have the involvement of a stakeholder group and I was concerned that if I announced I was working on a blueprint – bearing in mind that I'm not an economist, and of course this is economic work – that I might quickly run into instinctive resistance from people who would say "well who are you to present us with a blueprint?" So instead of using 'blueprint', as we were already running a REconomy project here, I decided to call the work in Herefordshire the TEEconomy project - which stands for Transition Enterprise Economy. I hoped this would create more interest. If you look at the reports you'll find that they are also titled Herefordshire Economic Evaluation. I believe that is a title that will be generic to all the projects: the Economic Evaluation projects. I don't think the fact that in Totnes it was called a blueprint and we called it something different is particularly important. The Totnes one, as you said, started out with a stakeholder group and then developed. You've taken a different approach, creating a report and then trying to build a stakeholder group around the evaluation. Could you give us a bit more of a sense of that? That was not the intention, but it was the way things worked out. As I said, we already had a REconomy programme going in Herefordshire. Where does this story start? 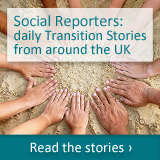 With the formation of Transition Hereford perhaps, or with the formation of the Herefordshire in Transition Alliance. To cut out the gestational period, we can probably best start with the birth of Herefordshire REconomy in early 2011, which by the time TEEconomy began had already attracted a decent amount of support but not, it has to be said, a stakeholder group. However, we had an interesting cross-section of people involved, including elected council officials, council officers, private sector, public sector, Green Party activists, environmental activists and so forth. There were, therefore, the beginnings of a stakeholder group. We also have a particular characteristic in Herefordshire which I don't believe is paralleled in Totnes, in the form of a long-established environmental charity - or social enterprise as it's become - called the Bulmer Foundation, whose remit is to foster the growth of sustainability in Herefordshire. So the expectation was that we would in time be able to draw together from this group of people already in the REconomy project a core group who might well become stakeholders. The Bulmer Foundation for example was involved with the Herefordshire Food Partnership, which had been developing county food strategy for some years, so it looked entirely possible that we would be able to build on these beginnings and run the project in a similar way to Totnes, using a stakeholder group. That is not the way it turned out and I would point to one or two reasons why this evolved in the way that it did. First of all, having announced the launch of the TEEconomy research - or Economic Evaluation project - at the REconomy launch event in June 2011, I set about establishing good one-to-one relationships with all the key people who would be feeding information into the process: officers from the local authority who have a lot of research strengths, also people in the aforementioned Bulmer Foundation and other key people around the area. From these I started to build what I thought would grow into a stakeholder group. What happened early on in that process was that the Department for Energy and Climate Change (DECC) roughly speaking threw a lot of pound notes in the air and presumably watched with interest (or possibly glee) as people who are normally sensible started running around the place picking up the money, so to speak. Everyone was united in feeling that this was not a satisfactory process. What it did in relation to TEEconomy was to take away the attention of the people I had begun to engage, whose focus was now on bidding for and then fulfilling in a very short time scale the DECC LEAF projects. That left me with few options other than to try to work in a parallel fashion and in a complementary way to this other work going on, which was what I then set out to do. However it had the effect of pulling the rug out from under the intention to put together a stakeholder group, because there were so many other demands on people's time. That was at the very beginning of 2012, and the meeting which launched the final Herefordshire reports was in May 2013, so you can see that was quite a long period of time and there's a story behind that too. We held a very successful meeting in July 2012 when Fiona came to Hereford as part of her road trip around the UK – she was handling the work down in Totnes and was overall in charge of the Economic Evaluation projects. This was at a point when I had done a lot of work on the food report but for the reason above had not made headway with either of the other reports. We succeeded in bringing together a cross-section of movers and shakers from the whole of the Herefordshire to hear Fiona present where she had got to in Totnes with the Economic Evaluation work, and I presented where we had got to in Herefordshire. At this meeting we had, for example, senior people from the Chamber of Commerce, the Chair of the Business Board, people from large housing associations, the council's Cabinet member for Planning and Environment, senior local authority officers in economic development, alongside others from the environmental activist community, Green Party councillors and so forth. The audience was a genuine social cross-section and they were all very interested and stuck around for the entire duration. Coming to the recent launch meeting in May, we didn't attract such a good cross-section, which was a disappointment. On the other hand, from those present there was a high degree of interest and congratulations and positive enthusiasm for the work that had been done. Fiona and I collaborated in presenting principally the work from Herefordshire, and Fiona referred to the work in Totnes as well. So what we're waiting to see at this point is whether that degree of positive reception and enthusiasm is capable of translating itself into a group that will take on board the results of all this work and put it to good use. How easy did you find it to find all the data that you needed – creating a blueprint like this is a very data-heavy process. How easy did you find it to track all that down? There were three different aspects to the research: to look into the renewable energy potential of Herefordshire, to look into the food growing and distribution potential of Herefordshire, and to look into the housing retrofit potential for Herefordshire, assessing the benefit of each to the local economy. There's an enormous amount of data out there, but the problem is you can't always get what you want and sometimes what you think you've got turns out to be deeply flawed. Just because an expensive consultancy has produced a data-rich report doesn't mean you should rely on it, and in fact we found that out the hard way in a couple of respects. For example, we had what purported to be a good report on renewable energy commissioned by the local authority. However we relied in part on one particular piece of information in that report which further down the road we discovered was completely wrong, meaning we had to go back and rework a lot of our figures. And again, there was a report which would have fed a lot of useful information into the housing retrofit part of the work but was just terribly flawed. It had some useful stuff but was really quite hopeless in other respects. I got a lot of information from my contacts in the Research Unit at the local authority which was very helpful, and also from officers involved in sustainability and in delivering household energy efficiency work. One might say that the problem was almost too much information: literally if you had to read through all that I accumulated you would never have got anything else done. The challenge is to decide what is relevant and what is useful and to then extract from that answers to the questions that you've posed - which means you have to be clear about what questions you're trying to answer. 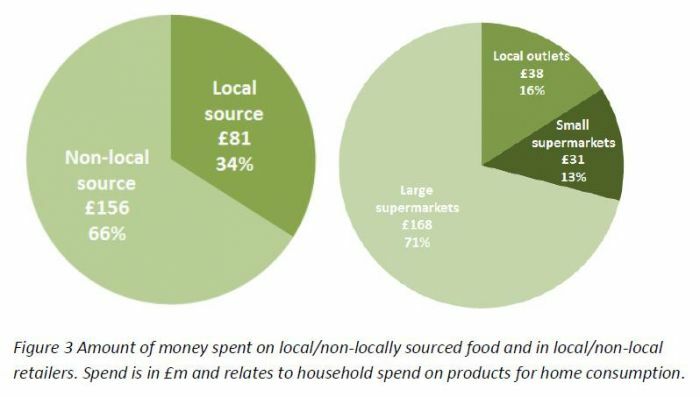 An early indication of how interesting and useful this work could be was when I asked a question of a knowledgeable person at the Bulmer Foundation: "How much do we know about what is spent in the county on purchasing food and drink?" – I expected the answer to be that this was a well-developed area of work, as the food strategy group has been working on this for some years, connected to the local authority. But instead the answer was – nobody knew. So that told me, helpfully, that the work we were doing was needed, but also told me that I was starting from somewhere near the ground floor. So you really do need to be pretty good with the old Excel spreadsheet if you want to do this work. You have to be pretty good with numbers and formulae and all that sort of thing, because really there is no substitute for looking into whatever reports you can find locally and also whatever you can get from the Office for National Statistics, at national or regional level as well as local. Then, you are going to have to do a lot of grinding with those numbers on your own to make them helpful for what you're trying to come up with locally. That is a considerable task. Fortunately I've done this kind of work when I was in waste management and am no stranger to Excel. It really does carry a lot of challenges and you need to be disciplined in the way you handle it or it becomes a quagmire in which you can sink. What would you say are the key findings that came out of this and what was its usefulness? Was there anything that surprised you about what's come out of it? I'm in no doubt about the usefulness - I've already pointed to the fact that what we're doing fills a missing gap. Lots of people talk about wanting to grow a sustainable local economy. People who are mainstream businesspeople would perhaps use very similar language. Everybody's interested in sustainability but what we did was to begin to put pound signs to some of the statements that were commonplace. It's all very well saying we know there's a lot of potential to grow some kind of renewable energy in Herefordshire, but just how much would that be worth and how much would it cost to build it? We now have figures. They are ball park figures admittedly - they probably stand to be sharpened up and perhaps even challenged, but at least we have begun the process of putting figures onto what this could be worth. Pound signs on the front of figures is a language that helps people to think in a language of economic decision making. Without those pound signs you might say it's possibly fruitless and likely to go round in circles. So we've contributed to mainstream discussion and I think we've also contributed usefully to what you might call the New Economics approach. Here we've got a grounded piece of work in a real situation that is quite focused and local, and hopefully people will be able to use this as a stepping stone towards doing similar things in other local areas. Once a few places have done this then we can get together and compare notes, and we'll start to build up a picture of what a grass-roots view of the national economy looks like - what the potential is if you connect up places like Herefordshire, Totnes, Brixton and hopefully another dozen places to come on stream in the next couple of years. Then we'll start to get a very different viewpoint from that which Chambers of Commerce and business boards tend to have. Some of this, of course, people know instinctively. People instinctively know that they and their neighbours are in and out of supermarkets all the time. We've been able to come up with some information that's really interesting, in that putting a number to this enables them to say – wow, did you realise just how much...? Just to use your example, this is the sort of information that I hope will cut through to the professionals, to the officers in the council who are responsible for economic strategy, and also to ordinary people on the street. Hopefully all will be interested to know that we spend half a billion pounds a year on food and drink in Herefordshire - that is a staggering amount of money - and then to tell them that three-fifths of that money is leaving the local economy straight away bringing marginal benefit to people who are living here; and to then move on to saying – look at the difference between spending a pound in a supermarket and spending a pound in a locally-owned store on local produce; and to follow that through by introducing the language of 'local multiplier' or of 'Plugging the Leaks' as the New Economics Foundation might say it. Understand, that if you spend a pound on carrots in a supermarket or spend a pound on carrots in a local independent store, these have two dramatically different effects on the future of your children. I hope that we've equipped an argument that will actually help change people's behaviour: their buying habits and the way that they think about what they're doing when they go into a supermarket, or how they think about the additional expense of buying locally produced organic carrots in a locally owned store. And of course at the moment the whole push from central government for economic growth and then the push through the local enterprise partnerships and so on, really seems to be focusing predominantly on trying to grow that 83% of the economy, not the 16% that you identify as being the local spend and indeed sees that 16% local spend as being backward, out of date, uncompetitive, standing in the way of growth rather than supporting it. How do you think that this report can contribute to these discussions? Yes, the local authority economic strategy has I think less than one quarter of one page about the growth of new local enterprises. It's simply not developed. They acknowledge it but they don't seem to want to develop that in any full way. Less than 200 metres away from where I'm sitting, there is a massive new construction going up which is supposed to be the economic salvation of Herefordshire - it includes a Waitrose, a Debenhams, a multiplex cinema. This is the old model of economic growth going up right next to where I did a lot of the research for this project. And only a couple of miles away we've got an enterprise zone which again is supposed to be part of this economic salvation. The most public feature of that development is planned to be a Georgian aircraft manufacturer coming to build aircraft components in Herefordshire, while so little resource is going to pave the way for the growth of locally-owned businesses. We are here right on the front line of that unsustainable old-model growth versus new alternative visions of the economy. Our reports are supposed to strengthen the hand of people in the mainstream, some of whom are very sympathetic to what we're talking about and hopefully will pick up the tools that we're offering. And also to equip those people who are perhaps outside the mainstream but knocking on the door, creating new local enterprises and arguing vociferously against the importation of yet more supermarkets into Herefordshire. There are active proposals for these : the Waitrose I've just mentioned, and also for a massive Sainsburys in a small market town. This is being actively fought over at present and hopefully our work will enable a sensible debate and common ground to be discovered between people who on the face of it are opposing factions. How replicable do you get a sense, having done this evaluation process, does it feel? What would a Transition initiative need to be able to think about doing a good job of this in their place? Would it be possible to do this work without funding, I wonder? We had funding which in my case was absolutely essential. There's no way I could have done this scale of work unpaid, and actually in this kind of work the question of credibility is important. What you're trying to do is come up with a report that will stand its ground alongside all the reports that have been commissioned by the local authority or other national agencies. There needs to be a certain depth and quality to that work, which it's hard to believe could be delivered on a voluntary basis. But then I don't want to set the bar too high. Anybody could start the process of doing this simply by establishing a relationship with the relevant research officers in their local authority and beginning to ask – what can you tell me about food, or energy. A lot of the answers may be "sorry, don't know", but those answers give you confirmation that what you're on the track of is worth doing. Then you could follow the path that I and Totnes have outlined. I put quite a lot of time into developing extensive references to accompany these reports. there are separate stand-alone documents that give all the links anybody could want to the source material I used. Hopefully that will save people a lot of time, that you can drill straight through into the particular spreadsheets available from the Office for National Statistics that will give you, wherever you are in the UK, the sort of information you need. When you get there, you will need what I would consider to be pretty expert skills at handling data. I think that there is a role here for one or more people – I think two heads are certainly better than one and a small group of people working on this would be even better than one or two heads – and you may need funding in there. You need a core group of people. You could call it a stakeholder group but that suggests something a bit bigger to me. I think you probably need a committed group of three or four people and one person who spends quite a lot of time and skills following the path that my and Fiona's work have piloted. I think it's going to be very different in different areas, depending on what's available and how much help you can get from the agencies that hold the data, and from people involved in the Transition movement. Lastly, what happens next? Where are you hoping that this will lead to n how do you get there from here now that you've completed this incredible piece of work? The key thing is, who's going to pick it up? I'm willing to be a part of what happens next but my role in terms of pathfinding is now over - therefore what I'm going to do is work with local REconomy groups. For those who've already got some kind of REconomy group in their area, that is clearly a big part of the answer to 'what next'. Beyond that, this morning I replied to an interesting email sent to me by an agency that supported some of the work we did in this project. It explores the link between what happens locally and the LEPs, the Local Enterprise Partnerships. I think that is where we're heading, to be part of a larger voluntary-sector initiative challenging mainstream economics. I count all environmental groups as belonging to what you might call either voluntary sector or civil society. Acting together, we need to really force our presence into the Local Enterprise Partnerships. This interesting document suggests that there are more levers than we realised on which we can pull to do that. We want to be sitting at what has become the top table in terms of economic funding and strategy in most regions, which is the Local Enterprise Partnerships. The REconomy group that we've got here in Herefordshire is still several steps away from having that kind of status or credibility. We need to use the Economic Evaluation work which I believe has strength in its argument and strength in its data, and also has strength in that we've done something nobody else has really done. We need to use this as a bargaining chip or leverage to say – look, REconomy is actually needed as part of the economic dialogue. It is needed as part of the solution to the problems that everybody knows we are facing in this country. That means it needs to be a part of the strategic policy-making structures in our region. That's where I'm headed, together with the REconomy group locally. I would suggest that people need to be pointing efforts into the strategic structures, but how you do that will vary widely depending on the resources you've already got. If you haven't got something like a REconomy group, then I think you need to start to build that. Some REconomy groups are loaded towards the practical setting up of enterprises, which is also essential knowledge. In Herefordshire it was always a characteristic that we were much stronger on the strategic side. Perhaps what I'm saying here simply reflects the historic development of the environmental movement in Herefordshire, and that I think we're now ready to push forward into making those further steps. People in other places may view this quite differently.